Brazil forward Neymar has said he would like to play alongside Liverpool's Philippe Coutinho at Barcelona. 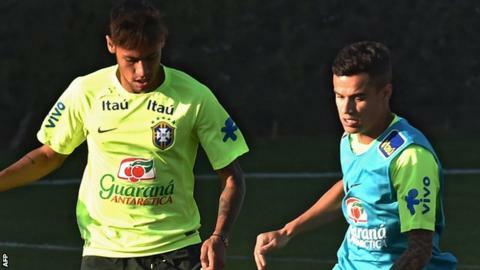 Neymar and national team-mate Coutinho, both 23, know each other from their time in their country's youth set-up. Spanish media have linked Reds playmaker Coutinho, a 2013 signing from Inter, with a move to Barca. "I see many Brazilian players with quality today. But one I like and think could play here is Coutinho. He has the style of Barcelona," said Neymar. Coutinho, capped 12 times for Brazil, has played 108 times for Liverpool, scoring 17 goals, including the winner in the 1-0 win at Stoke on the opening weekend of the Premier League season.